The Dime™ is a kid-sized version of our rugged Quarter™ adult helmet featuring a tough outer shell with impact-absorbing EPS liner, riveted webbing anchors and plush, sweat absorbent pads that are easy to swap for adjusting the fit. It also features a polyurethane coating to help protect the edges of the EPS liner. 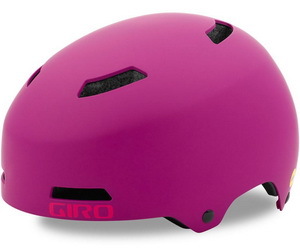 All Giro helmets are designed to reduce as much energy as possible while meeting and exceeding stringent safety standards.